Choosing where to go for your Christmas meal is always a tough decision, whether it’s for Christmas Day or a Christmas party in December. Therefore, we’ve made it easier for you. Wherever you live, if it’s in the same location as one of our Titan stores, we’ve sourced the best locations for you to go for your Christmas dinner in 2017! 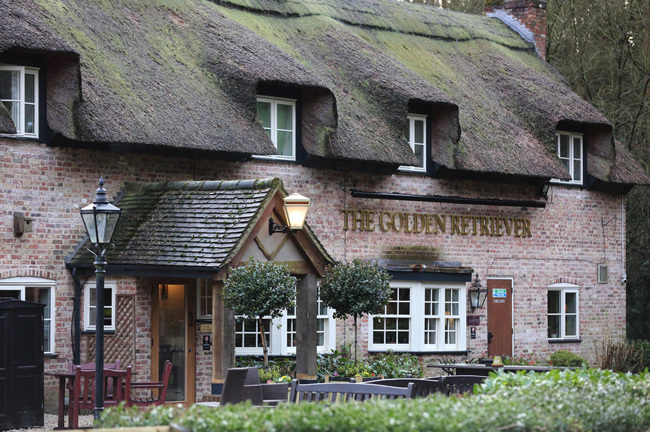 Whether you’re looking for a quiet, relaxing drink with some work colleagues or a celebratory Christmas get-together with your loved ones, The Golden Retriever is the perfect setting. With a special 3-course-menu for Christmas Day itself and a fantastic festive menu for all the days in-between, no other destination could create as special an atmosphere. The festive menu is a sumptuous collection of decadent dishes, designed to tickle your tastebuds and bring the magic of Christmas straight to your plate. Starters include a duck and port parfait and a king prawn and lobster cocktail, and the mains sound equally delicious, with hand-carved turkey breast with a variety of delicious trimmings or a sweet potato and vegetable mixed nut roast. And who could forget dessert; opt for Christmas pudding, mulled plum and almond Bakewell tart or a rich chocolate torte. For more information and to book a table, head to their website here. This fantastic restaurant prides itself on providing the freshest, most delicious food for your Christmas party or gathering during the month of December with its range of Christmas menus to suit any occasion, all the way from the beginning of December, past Christmas Day to New Year’s Eve. This contemporary, family-run venue has a wonderfully sophisticated, yet friendly atmosphere to entice any diner to spend a while catching up with friends and family. Their first rate à la carte menu is a wonderful selection of fresh and seasonal dishes that suit every palate, imbued with festive cheer. Their Christmas party menu is the perfect place to get a sense of the Christmas dishes they offer, with smooth duck and orange pâté and deep-fried brie available as starters. For mains, choose from the traditional turkey breast, or try something a little off-piste with their slow cooked pork belly or wild mushroom risotto. Finally finish off your meal with Christmas pudding, or their exotic cassata – homemade ice cream with pistachios, cherries and chocolate! If you feel that this restaurant is the perfect place for your Christmas dinner in 2017, visit their website to find out more. With a key focus on blending the classic with the innovative, The White Horse is the ideal location for a Christmas lunch, dinner or drinks party, since it channels the vibrant and unique into a celebration of Christmas festivity and cheer. During the festive season, discover both the lively atmosphere and friendly nature, as well as the fantastic drinks selection and carefully crafted seasonal dishes from the large variety of festive menus. With a wonderful selection of mouth-watering food, such as their ham hock, pea and wild garlic terrine, or their beef short rib, and not to mention their Belgian chocolate and caramel mousse or their strawberry and prosecco sorbet, there’s something to whet everyone’s palate! To view all of their festive menus and enquire about booking for your Christmas party, click here. Celebrate Christmas in style at The Swan, a fabulously classy bar and kitchen situated in Arundel, with your friends or colleagues. Everything you need for a great night out during the festive season is right in one place, including a fantastic range of food and drinks. With a wide selection of festive menus, linked to certain days in the holiday season, celebrate Christmas with food you’ll never forget. With enticing dishes, such as the duck rillettes with spiced apple chutney, the fantastic trimmings for the roast Usk Vale turkey breast, and the Black Cab Christmas pudding on the Christmas party menu, your guests will be well catered for and will be imbued with the kind of Christmas cheer that only food can provide. Find the full menu and book your table here. Celebrate with a festive twist at The Strawberry Bank with a specially created Christmas Fayre menu full of three fantastic courses to fully welcome in the Christmas season from the 1st December, and their specially tailored Christmas Day menu. Whether it’s a large party or an intimate family meal, their chef’s creative menu will be sure to put a smile on everyone’s faces. With a complimentary glass of prosecco to start off your meal, you’re sure to love the selection of wonderful dishes. From leek, tomato and gruyere tart or ham hock terrine for a starter, to the traditional Roast Warwickshire turkey breast or the pan-fried trout and Devon crab for a main, you’ll have a fantastic selection to choose from. However, make sure you leave room for dessert, as the Christmas pudding or nutmeg and vanilla cheesecake can’t be missed! Start organising your Christmas meal to remember at The Strawberry Bank by visiting their website. Celebrate Christmas, beautifully fashioned, at The Maybury Inn with their fantastic Christmas menu selections, designed so that all you have to do is focus on what’s really important – celebrating in style with your loved ones. Enjoy a meal of truly indulgent flavours and dishes, freshly prepared with all the trimmings, from their festive menu. Start off your meal with a gorgeous Severn & Wye smoked salmon or a duck liver and port parfait and then follow one of those selections up with a number of fantastic main courses – such as roasted salmon wellington, roasted turkey breast, or slow-cooked smoky beef short rib. Save room for one of their gorgeous desserts, ranging from a gingerbread crème brûlée to a Belgian chocolate ganache torte or the classic Christmas pudding. For a Christmas celebration full of festive magic, book your table at The Maybury Inn here. From everyone here at Titan Storage, we hope you have a fantastic Christmas dinner at any of the locations mentioned above!